Mortal Kombat on the Vita is amazing to say the very least. Which is great for us Vita gamers that have been dying to play something on the system that hasn't already been out for a couple of months. Nothing new has gotten firm release dates and we're unfortunately running out of new games at a rapid pace. So when Mortal Kombat came out I had to dive in. I'm not exactly a fighting fan (although I did spend quite a bit of time in Super Street Fighter IV [all version minus the newest Arcade version that hit consoles not too long ago]), but I need something new to play and well Mortal Kombat recently hit the weakening Vita line-up. I will spare the rest of this discussion for a later date. 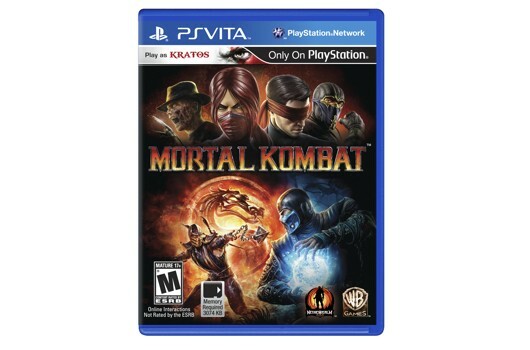 On to Mortal Kombat for the PlayStation Vita! 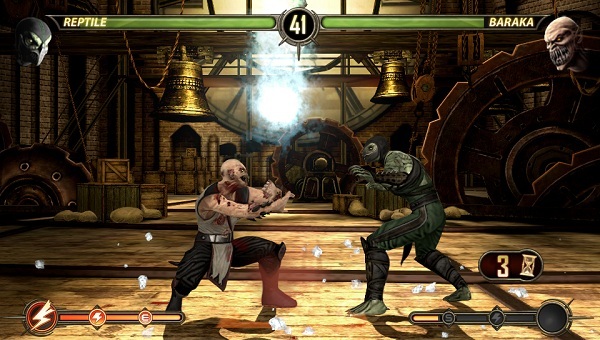 NetherRealm Studios released a re-boot of the franchise last year for the PS3 and 360 to great applause. Critics and fans alike loved the move to hit restart on a franchise that was becoming an eyesore. How much of that was the fault of the (now) defunct Midway Games or just the talent behind the scenes had really lost the magic they had during the nineties? Well considering the team at NetherRealm consists of the former Mortal Kombat guys...I think it is clear who was at fault for the terrible PS2 gen MK titles. I want to get the negatives out-of-the-way now. Graphically this game is great...that is until I went into kombat. The character models in the cut-scenes looked fantastic, however that ended once the battle began. These characters look awful when NOT in motion. I say not in motion, because they do improve when the battle is raging (or I just didn't notice the badness when I started playing). Going from tremendous near HD cut-scene graphics to slightly better than mid-gen PS2 graphics is just tough on the eyes. The textures are bad and the four most terrible character models were Kratos, Baraka, Shang Tsung and Scorpion. Looks even worse with that weird thing in the bottom right corner. Now with the graphics behind this reviewers focus I can talk about the great aspects to Mortal Kombat on Vita. 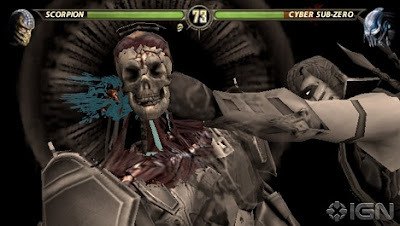 NetherRealm has crafted Mortal Kombat into one of the best (if not the best) handheld fighting game ever. The combat (spelled correctly, sorry Ed Boon) was silky smooth and when the action gets fierce there was no lag. I'm pleasantly surprised that the Vita (this early into the life-cycle) is holding up so well. From Uncharted: Golden Abyss, Super Stardust Delta and now Mortal Kombat I have yet to see the system struggle to keep up with the intense action that fills the screen. And with MK the action definitely gets very intense as moves (and characters) fly across the screen with fury. Vita gets to have exclusive content like a brand new challenge tower full of 150 challenges and comes packed with all the DLC content that released for the PS3 and 360 versions of the game throughout the past year. However, Vita players will also get to play as Kratos who was the exclusive character to the PlayStation 3 version of the game. There are also some Vita only mini-games that feel gimmicky, but were fun. These modes are “Test Your Slice” which is basically Fruit Ninja and “Test Your Balance” that tasked the player with...maintaining your balance by using the gyroscope in the Vita. Another interesting feature is using the touchscreen to perform fatalities. I don't know about other people who live fighting games, but pulling off complex moves is challenging. Maybe the touchscreen just made the input too easy, but I enjoyed being able to end the lives of these characters with minimal effort. The Vita was in desperate need for some firepower and it got it out of Mortal Kombat. This is a very detailed fighter that had me going for a long time. I enjoyed learning the characters and was overjoyed when I stumbled across a hidden X-Ray attack. I highly recommend picking this game up.